The Newfoundland dog is a favorite amongst fans of giant dog breeds. Here you'll find information on the breed including statistics like weight and height, behavior patterns, common health problems and the breed's history. Colors: Newfoundlands can be black, brown or gray. There's also another color which is recognized – white with black markings – which is known as landseer. These are the officially recognized colors according to the American Kennel Club – as Newfoundlands with different coloration would not be recognized as a purebred by the AKC. 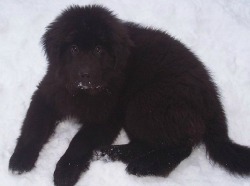 The breed developed in (and is named after) Newfoundland in Canada. The breed has a strong element of mastiff genetics. The dogs were originally bred as workers, typically to help fisherman with hauling heavy objects or catches in the harsh, cold climate. Like their close relative, the St Bernard, Newfies have also often been used as rescue dogs – in particular for water rescue, due to their excellent swimming ability. Many Newfies still have an in-built tendency to rescue struggling people from water, even if they haven't been trained for rescue purposes. Newfies are well known for being gentle giants – although they are a large breed, they are typically relaxed and very friendly. Aggression is a rarity in this breed, making them an ideal pet for families – although be aware that due to their size they can be overwhelming to very small children. If your children are under the age of 3 or 4, it might be wise to hold off on getting a Newf until the kids are bigger and not so easily knocked around by a large dog. Newfies are quite smart and fairly easy to train, especially for activities they have a genetic tendency towards such as fetching and retrieving. A short daily walk should be enough to keep Newf happy and in good shape, although bear in mind that this is a giant breed and requires plenty of yard space to roam in. As noted above, this breed enjoys the water, so including regular swims as part of the exercise routine is recommended. Hsip dysplasia is one of the most common health issues affecting this breed. This is when the hip ball-and-socket joint is not formed properly, leading to a wearing of bone against bone – this can be very painful for the dog. Heart problems can also affect many Newfies. A disease called SAS (subvalvular aortic stenosis) affects Newfies more commonly than other dog breeds – it can cause heart seizures resulting in sudden death, and unfortunately it's quite difficult to identify and diagnose.